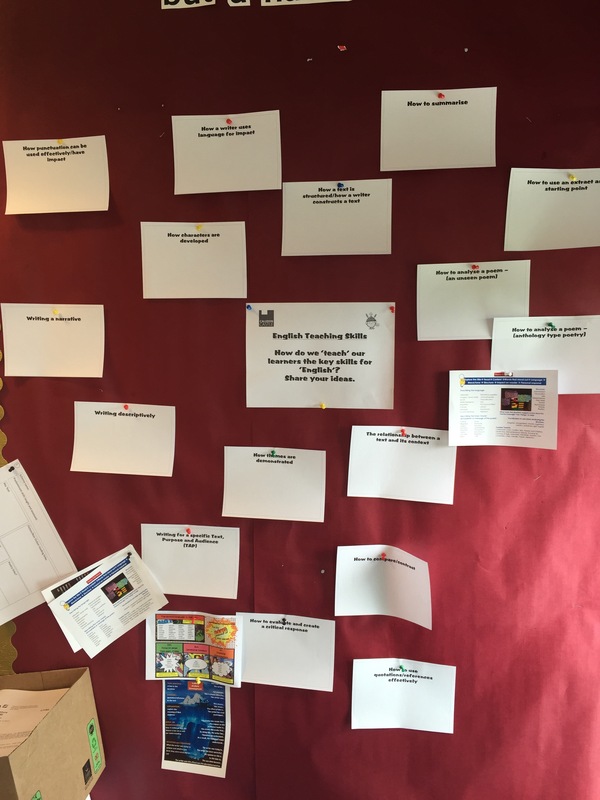 A Buzz about Teaching - @kathydarlison85 | Sharing Teaching and Learning things! Come along to the interactive session led by Andy Lewis, Eddie Evans and Kathy Darlison on Thursday 5th February at 3.15. It kicks off in Room 3 but be prepared to move around, and move places, as we demonstrate how you can utilise different spaces and working environments across the school! 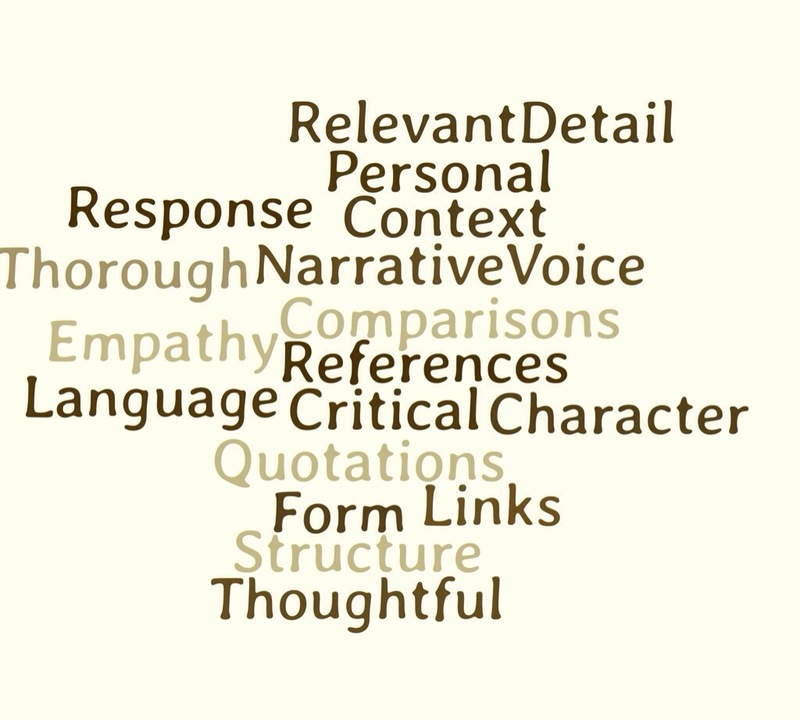 Another tool I have found useful for revision is Word Clouds/Wordles/Tag Clouds call them what you will! I have used them in a couple of ways in the last few weeks and shared these ideas when I met up with Rachael Stevens and Fran Nantongwe at the beginning if April and they were really positive about them. 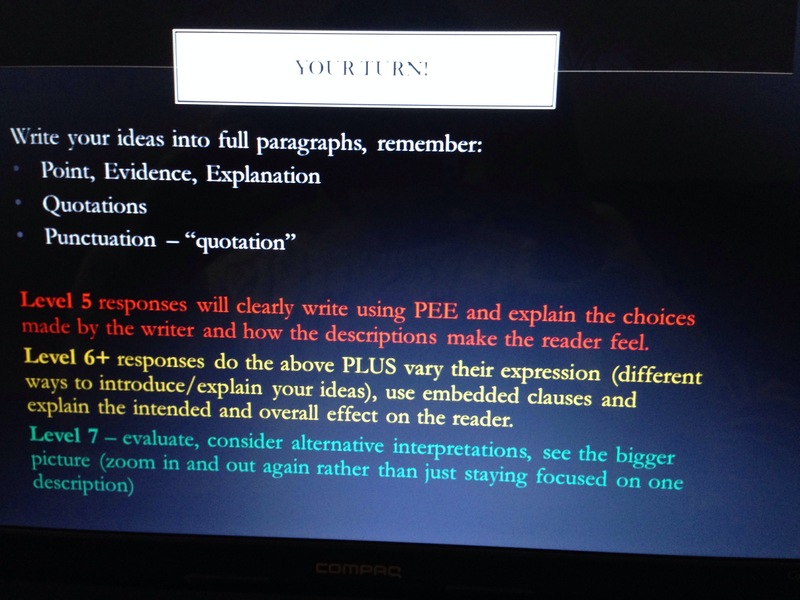 Firstly I’ve used them to highlight key words from the exam specification. Each student had one in to stick in their books and we displayed it on the Interactive Board. 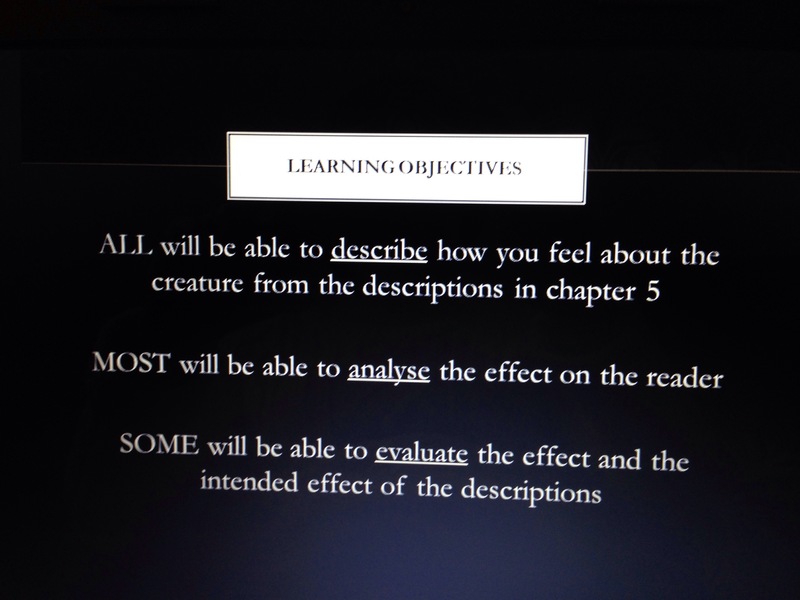 I gave the class a few minutes to discuss the words and how we have encountered them already in our learning. Pupils were great in their feedback and I enhanced the discussion with clear explanations of what was expected of them in the different parts of the exams. Secondly I have used them alongside the ‘reduction’ principle to help highlight key words from or about each chapter of ‘About a Boy’. 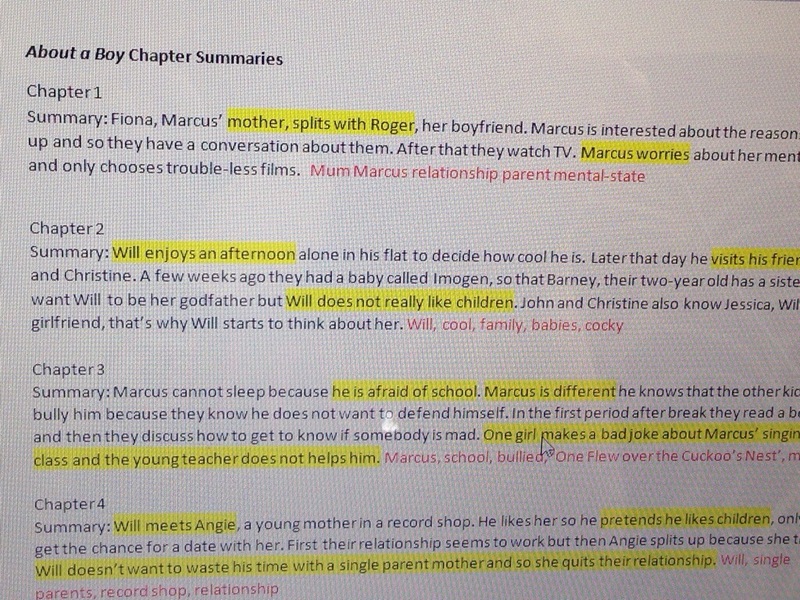 For homework, I have years 10&11 chapter summaries for the 36 chapters of the novel. 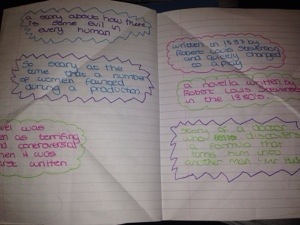 Their task was to highlight the key parts from the chapter summaries then reduce the main parts to 3-5 key words. 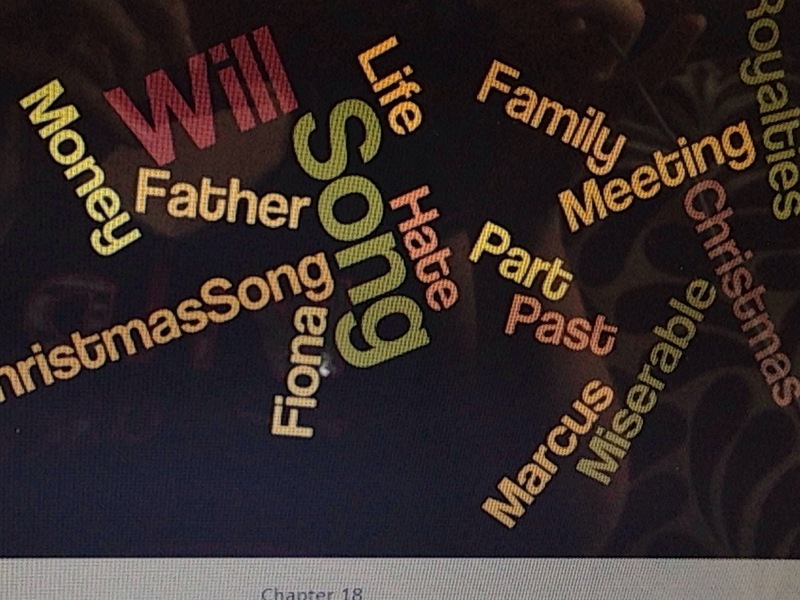 I then sifted through the pupils’ reductions and made a word cloud for each chapter. It was quite a long process but worth it I think. I then plan to upload these to the VTE for pupils to access and also print them off and display them around my classroom as a helpful visual aid. 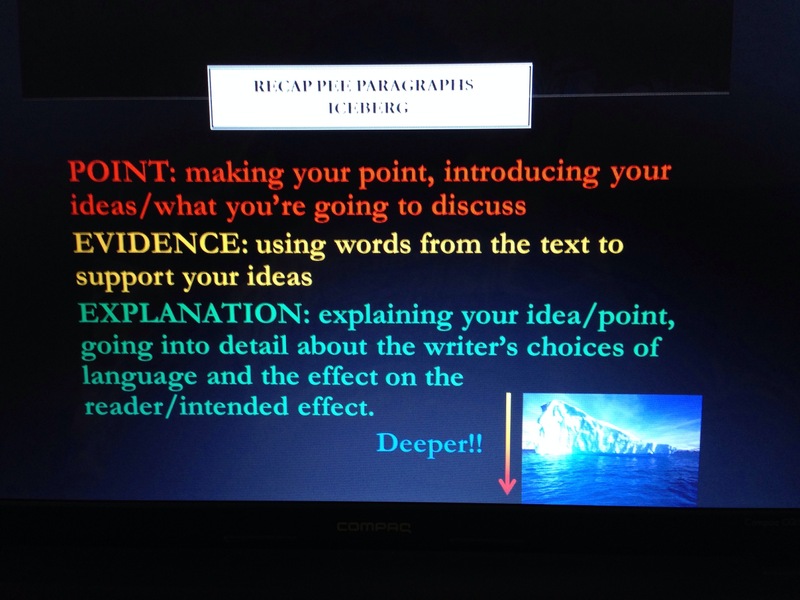 I love visual things but hopefully coupling this with the reduction principle will be helpful in getting pupils to remember key things from the chapters. I wanted to try and make revision a little more fun so I am using some plastic eggs I found on sale in a super market so that I can hide discussion prompts inside to get pupils talking about the characters, themes, symbols, social context and different essay questions as part of their revision. 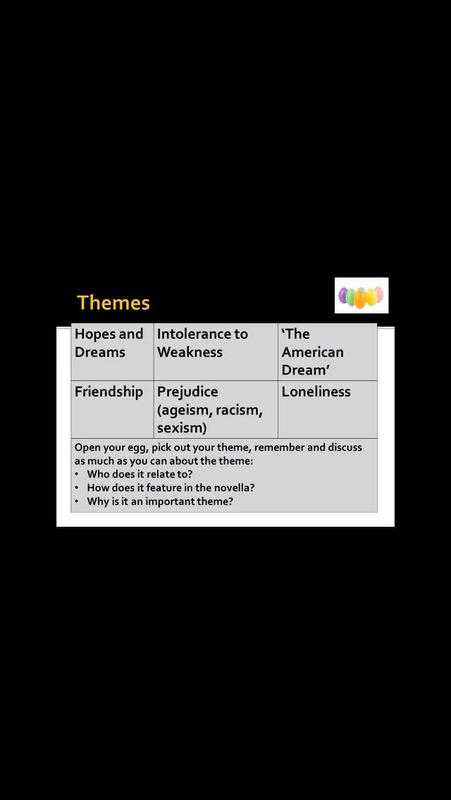 I know hiding prompts in eggs isn’t revolutionary but I am hoping to make pupils have thoughtful conversations of the different areas we’ve been learning for Of Mice and Men; draw links between things and be able to discuss a range of difficult questions that are open ended so they have been encouraged to ‘think’ about their response and develop and answer that is thoughtful and personal. 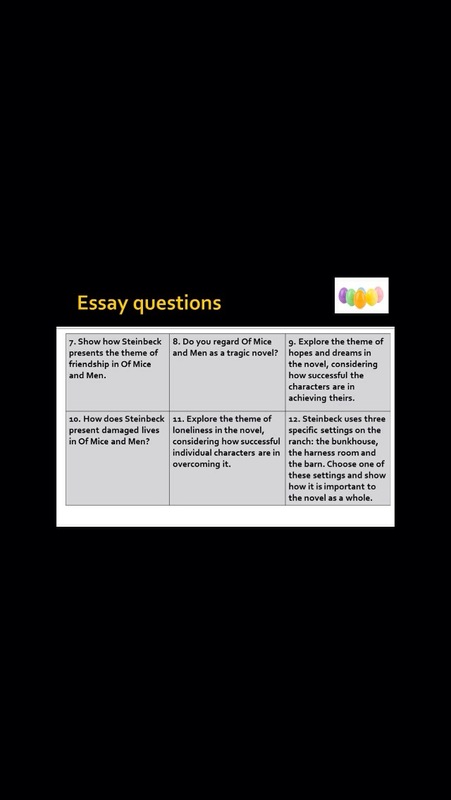 The first stage of the lesson will focus on individual discussion prompts: character, themes and Sybil’s for the novella. 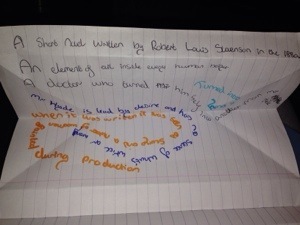 Pupils pick an egg, open it, discuss what is inside and remember why that particular item is important in the novel. Through discussion their memories will be jogged and they will have hopefully shared ideas and picked up some things they’ve forgotten or not thought of from others in their group. 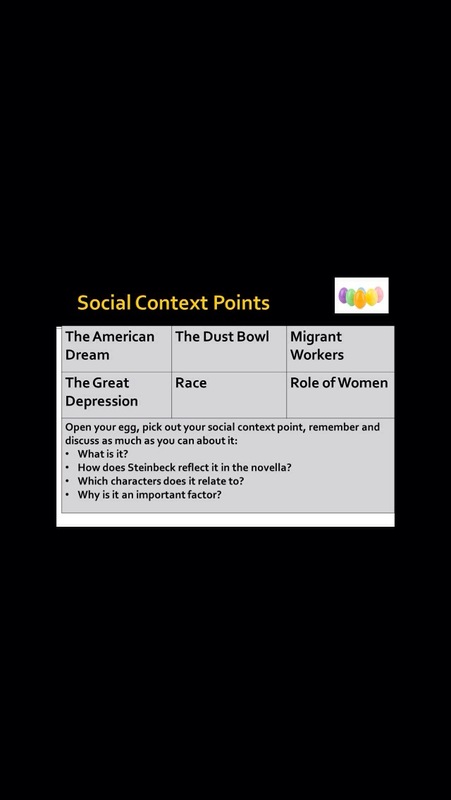 Secondly pupils will discuss key social context points but they must now develop their discussion to make links between Steinbeck’s intentions and how his writing reflects these elements of the social context. 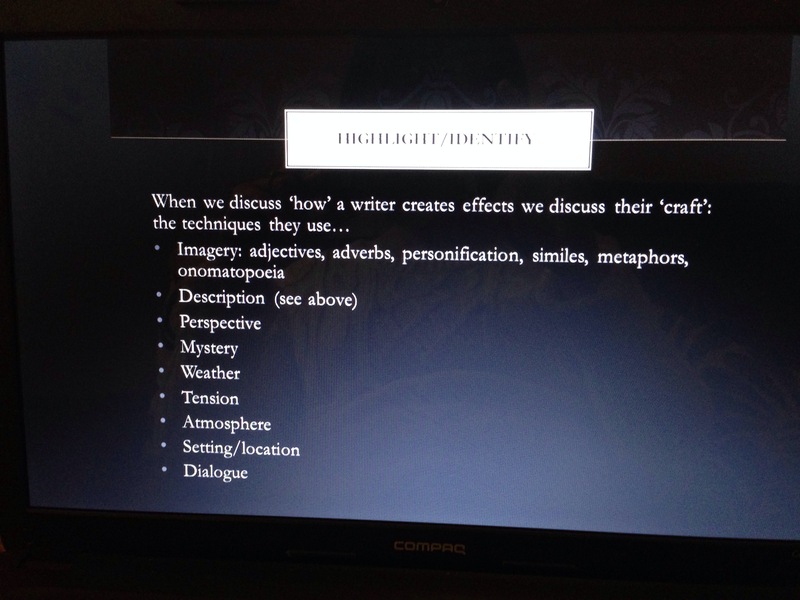 Thirdly pupils will now pull all their leaning together by discussing very open essay questions. They will hunt for these as they’ll be hidden around the room (to get pupils moving and more active!). 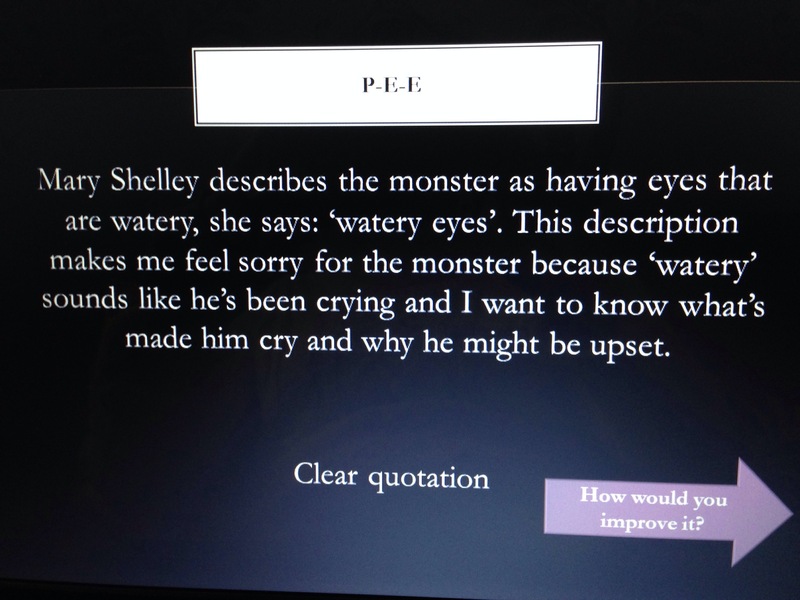 In small groups, pupils hunt for an egg, read the essay question discuss how they might tackle it and then repeat the process. 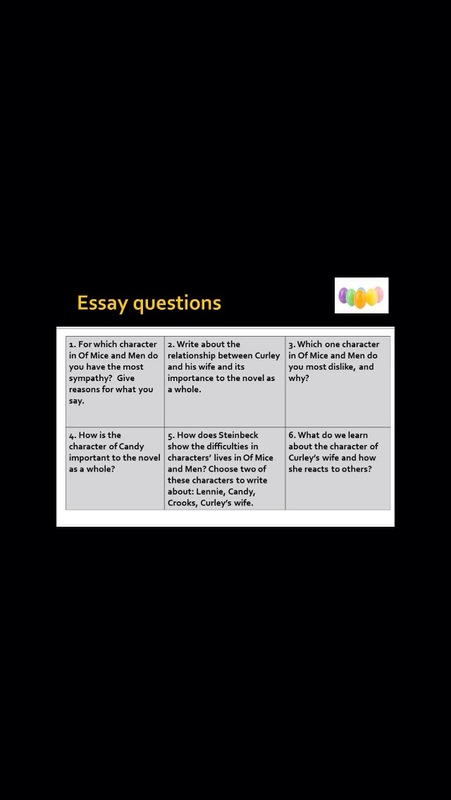 I am trying to encourage my pupil to really develop a personal and critical response to the question they are given I the exam rather than just regurgitate what they have leant about the characters, setting, themes, symbols and social context. This activity will give pupils an opportunity to think and share ideas collaboratively and hopefully this will develop some confidence in being able to tackle more difficult questions. 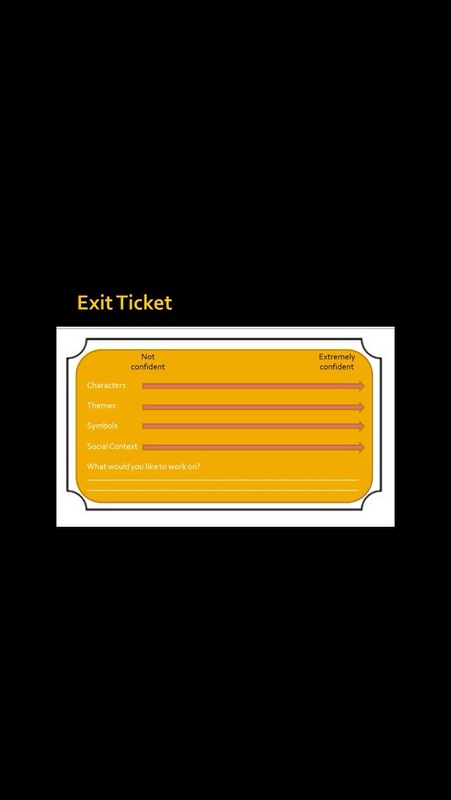 Finally pupils will sum up their revision experience by filling in an exit ticket to show me and themselves what they’re most confident in and what they’d still like to work on; this will then inform my last revision session with them before the exam. I hope this works as I know revision can often be dry but I wanted it to be active and verbal so hopefully pupils will remember it and the eggs, well they’re just to make it brighter and more fun! Let me know if you have any thoughts/ suggestions. 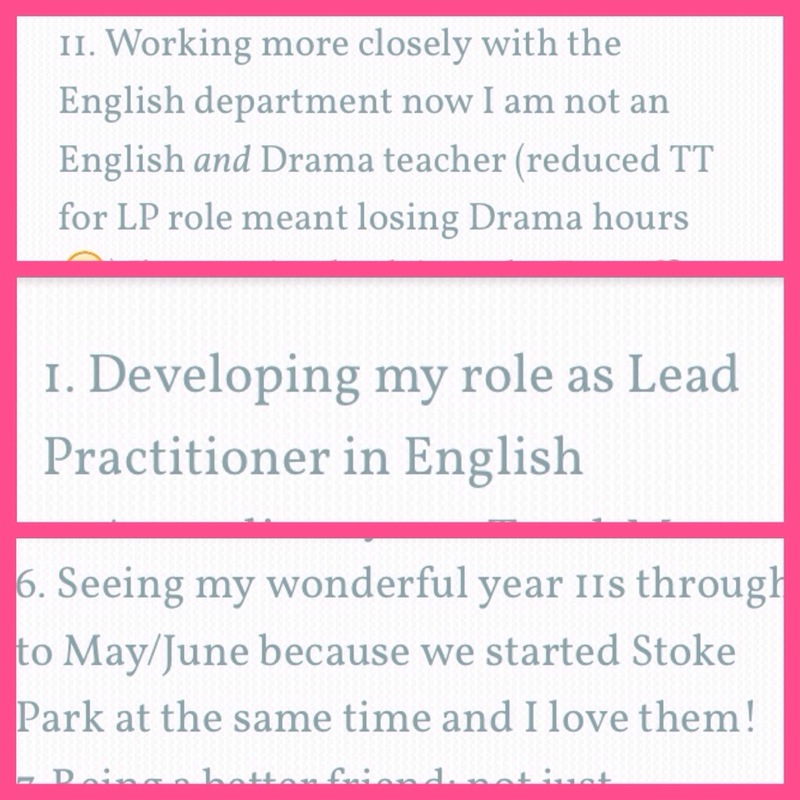 I have moved back into the English Office this week so I can work more closely with my English colleagues, as part of my LP role and I have had the best week! It’s been lovely being in the same environment as them; talking things ‘English’; sharing ideas; sharing marking and planning anxieties. It’s been very rewarding and I feel at home again. Following a meeting with out AHT i/c of T&L (acronym overload!) I now have some projects to focus on which involves coaching two staff to develop from Good to Outstanding and or agonising and planning some CPD to another school. All of my projects involve me working with people and focus on developing Teaching and Learning… Who could ask for a better job?! 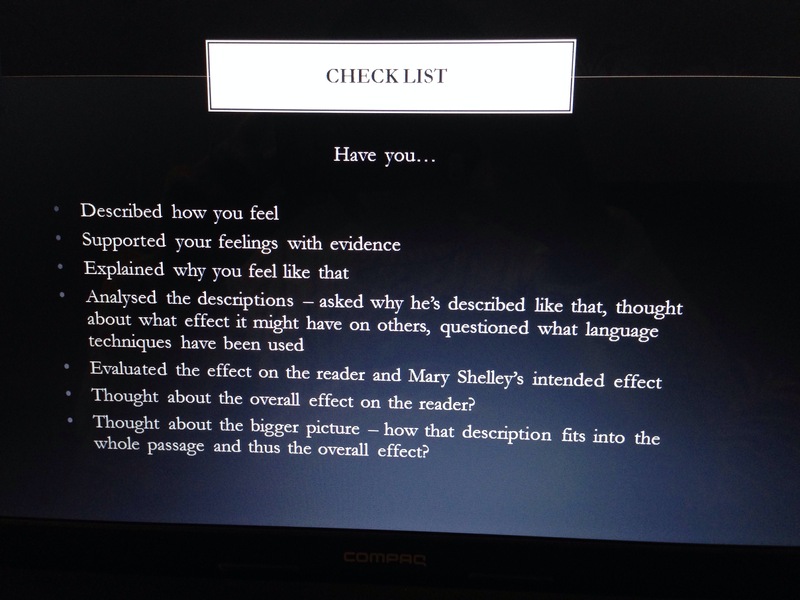 And finally following the wonderful year 11 results on Wednesday, the English department rejigged groups to allow pupils to focus either on English only or to now complete their Literature course. I was so proud of my class all but 2 achieved a C or a B and those who missed out missed out by a measly mark 😞. So it was with a heavy heart that I lost two students to another group but I retain the rest of my original class to focus on, and prepare them for their Lit exam which I am ecstatic about. What a tremendous first week back! 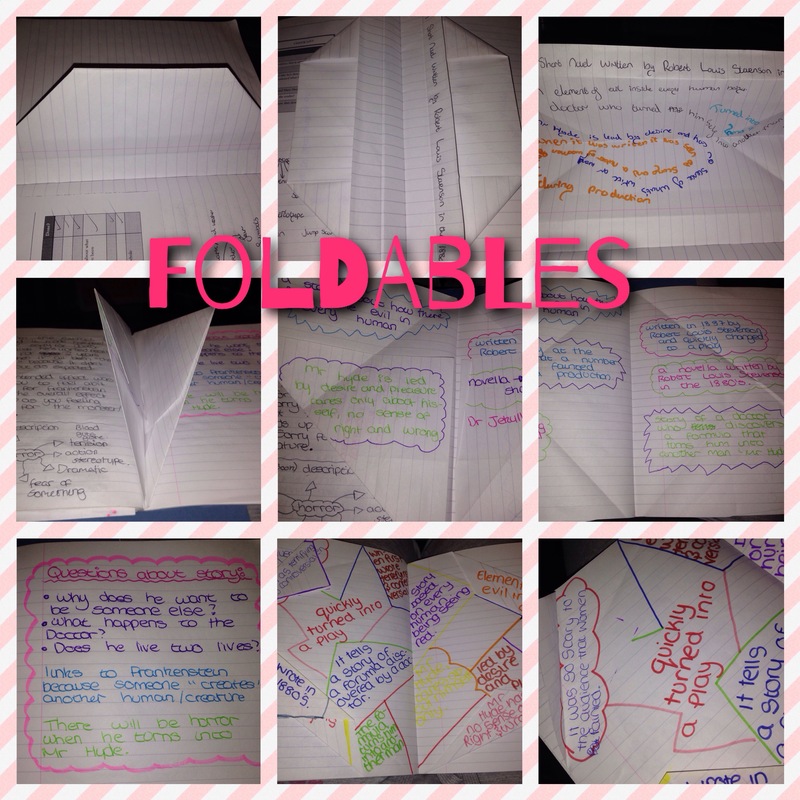 I picked up this ‘Foldable’ idea up on Twitter on Tuesday and decided to try it out. 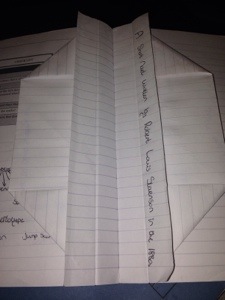 What: An interesting way to engage pupils with note-making and connecting with new information. 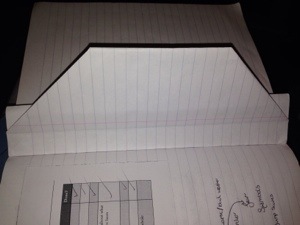 How: Pupils fold a double page in their exercise books in an ‘interesting way’. Why? They have their notes recorded in a fun and interesting way and have had to have thought about where certain bits of information go, in what order they go and how it looks. 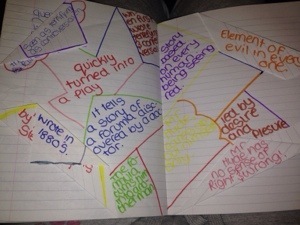 It would also work as a revision tool with notes they already have but they refocus their notes and reorganise it. A lesson in 5* slides (inspired by @Xris32) *or there abouts! Today I was really excited and impressed by something I saw @Xris32 on Twitter. He tweeted the crux of his year 7 poetry lesson using about 5 images of screen shots to capture the development of learning in the lesson. Having planned some of my lessons for year 9 tonight, I thought I’d share my first lesson back with then in a series if images with only a brief explanation (if I can help it!). 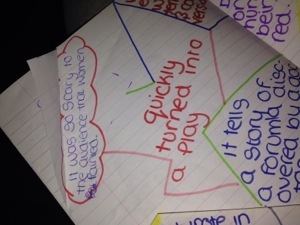 Year 9 ‘Mysteries from the Past’ – exploring how writers creat mystery, suspense, tension and horror in pre20th Century Literature. 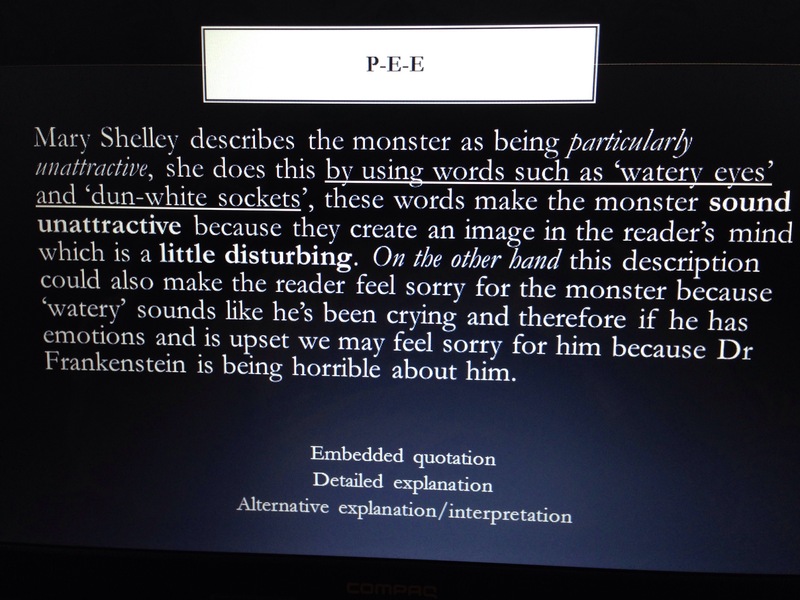 Having read the extract and already researched Mary Shelley before Christmas I want pupils to have a quick refresher and then revisit the text, identify writer’s techniques used and develop their explanations of how the writer affects the audience and why that effect is created. 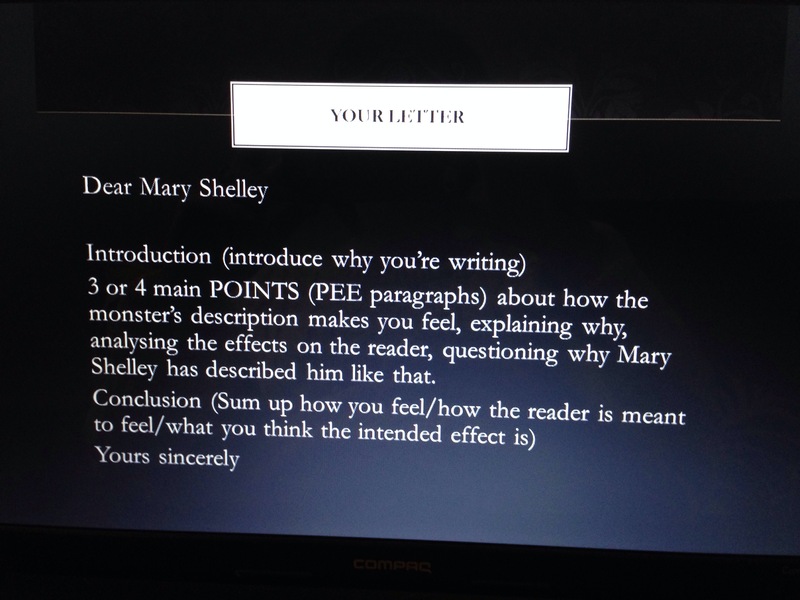 Ok so it was 8 slides but hopefully you get the idea. 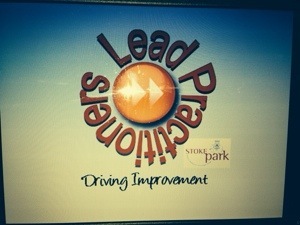 We are very excited about the new term and moving forward as a team to ‘drive improvement’ at our school!